Written with young readers in mind, this lively, lucid account of Australia and its people begins with the geographic shaping of the continent millions of years ago and continues to the present day. Here is the fascinating story of a land inhabited since the Ice Ages by Aboriginal tribes, a land which remained undiscovered by the rest of the world until the birth of the industrial age, when European settlement reshaped it in political and social terms. Original sources are used to highlight episodes that will especially appeal to young readers: we hear the voices of Aborigines bewildered by the advent of the Europeans, and of those who made the perilous journey across the world in sailing ships ...We share the weariness of explorers trudging towards a far horizon, and the elation of a lucky gold-digger ...We storm the heights at Gallipoli alongside the Anzacs, and realise what it must have been like to go hungry during the Great Depression, or to fight in the Jungles of New Guinea ...This history, a distinguished collaboration between Manning Clark and Meredith Hooper is lavishly decorated throughout in colour and black-and-white by Susanne Ferrier, whose illustrations perfectly complement the text and give the book an extra, vivid dimension of sheer visual enjoyment. History of Australia is a book to be shared, appreciated and enjoyed by all those eager to discover the story of this great new country. 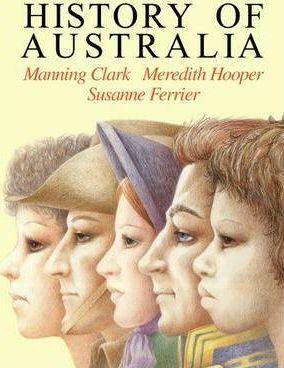 Manning Clark, an authority on the history of Australia, was born in Sydney in 1915, the son of an Anglican clergyman. He won a scholarship to the University of Melbourne, and later studied at Oxford. He lectured at the University of Melbourne before becoming Professor of History at the Australian National University. In 1975 he was appointed Companion of the Order of Australia in recognition of his major work, A History of Australia. He has been Visiting Professor of Australian History at Duke and Harvard Universities in the USA, and now holds the position of Library Fellow at the Australian National University. Meredith Hooper is a fourth-generation Australian. After graduating in history from the University of Adelaide, she continued her postgraduate studies at Oxford. Her commitment to the history of Australia has remained constant over a period of many years. She has written eleven books for young readers, ranging from Boeing 747s to American history, from Australian explorers to everyday inventions. She now lives in London, with her English husband and three children. Susanne de B. Ferrier was born in Melbourne. She began to draw when she was two years old, on the walls of her parent's dinning-room. None of her antecedents arrived with the First Fleet, but she has been led to believe that she is distantly related by marriage to a policeman who was once sent in pursuit of the bushranger Ned Kelly.